I can't wear contact lenses. A contact lens will get lost behind my eye. Contact lenses can get permanently stuck to my eye. While it's true that a soft contact lens can stick to the surface of your eye if it dries out, remoistening the lens by applying sterile saline or a multipurpose contact lens solution will get it moving again. Contact lenses are too much trouble to take care of. Wearing contact lenses causes eye problems. I'll never be able to get them in my eyes. Contacts can pop out of my eye. Contact lenses are too expensive. I'm too old to wear contact lenses. You don’t need to be a fashion expert to find eyeglass frames that look great on you. If you’ve ever walked into an optician’s office, you’ve seen the walls and racks full of an amazing array of eye wear. Choosing a pair of glasses can seem impossible, but our tips will help you narrow down the options and the right pair for your face, as well as your lifestyle and personality. Heart: wide forehead, high cheekbones and a narrow chin. Look for: aviators, butterfly and rimless styles that appear to broaden your chin and minimize forehead width. Oblong: narrow chin and cheeks and a large forehead. Look for: oversize styles and wraparound frames that make your face appear shorter and wider. Round: full cheekbones and little to no angles. Look for: rectangles, squares and sporty styles that make your face appear longer and thinner. Oval: chin slightly narrower than the forehead. Look for: both classic and trendy styles in a size that’s in proportion to your face. Square: broad forehead and strong jawline. Look for: rounded, oval, cat-eye and semi-rimless frames that soften the jaw line and make your face appear longer. There are eyeglass frames for every way of life! Think about the activities you will do while wearing your eyeglasses. If you're active, Oakley offers sporty frames which can twist and bend without breaking. Need gaming glasses? Gamers can choose from a wide selection of stylish frames that enhance the gaming experience. When impressing the big wigs at the office, you can accessorize your business savvy with sensible style. Fit Frames to Your Personality? The frames you wear can say a lot about your personality. You can have a pair of glasses that showcase your fun loving side on the weekends and a pair that emphasizes your get down to business tone during the week. Adorn your face with your favorite color (as long as it doesn’t clash with your skin tone) or detailed embellishments and flare. Choose either one style of frames to express your personality or have a small collection of frames on hand to easily alter your appearance to suit your mood. One eye exam every year should help you to stay on top of your eye health, but some people might need to schedule more than one exam in a year. Vision can change quite a bit over the course of a year, especially for those over the age of 50, and it is important to know when you need to schedule an exam. Colored Contact Lenses. Are contact lenses that change your eyes color. They are most popular during Halloween for costumes because they change your eye color, pupil shape, and give cartoon or film character effects to your eyes. Colored Contact Lenses are not FDA-approved. 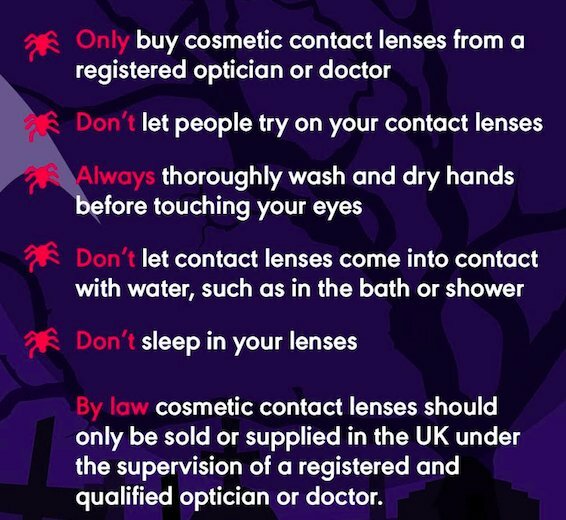 Never buy colored contact lenses from a business that doesn't ask for a prescription. In the United States it is illegal to sell any contact lenses without a prescription. Most of the lenses sold online, in beauty shops, and pop-up Halloween stores are sold illegally and are not FDA-approved. Risks of colored contact lenses on eye health. Non-prescription costume contacts can cut, scratch and infect your eye if they don't fit exactly right. Mis-sized lenses can cause corneal abrasions, corneal ulcers and potentially blinding painful bacterial infections like keratitis. Treating these injuries can require eye surgery, like a corneal transplant. And treatment doesn’t always work. People have been blinded by costume contact lenses. All contact lenses require an eye exam and proper fitting by an eye doctor. An eye exam will properly measure your eyes provide you with a prescription and inform you if contact lens are the right option for you. As well as instruct you about contact lens cleaning, disinfecting, and directions on wearing lenses. How To Protect Your Eyes Against Blue Lights? 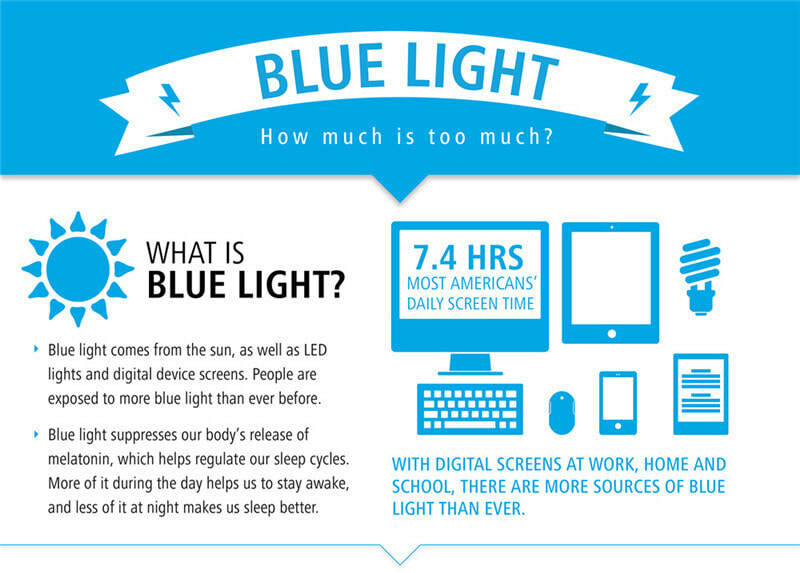 What to do to protect your eyes against the negative effects of blue light? Limit screen time when you are not working. In our digital age we constantly use digital screens at work, home, and, school. Give your eyes a break every 20 minutes look away from your screen and give your eyes a rest. The “20-20-20” rule: Every 20 minutes, shift your eyes to look at an object at least 20 feet away for at least 20 seconds. Most importantly don't forget to keep blinking while looking at your screens. Get regular comprehensive eye exams. Make sure to get an eye exam regularly from a licensed eye doctor (optometrist). Eye exams help you evaluate not only your vision, but also the complete health of your eyes. They can prevent serious eye care health problems such as glaucoma, cataracts, macular, degeneration, and detached retina. If you use your devices at night, use screen filters. Always remember to stop using electronic device an hour before bed. And turn on screen filters on all your electronic devices at night. This can warm up the lighting on your devices and make it easier on your eyes. Use Computer glasses and Anti-reflective lenses. Don't settle for regular cheap glasses. Get fitted for blue light filtering lenses to block the penetration of blue light from computers and digital devices. They're available for prescription and non-prescription glasses.